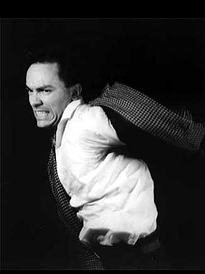 Paul Langland is a dancer, choreographer, singer, and Associate Arts Professor at the Experimental Theater Wing at NYU. He has been a Contact Improvisation practitioner since the first year of it's discovery in 1972. He was an original member of the Meredith Monk Co. Vocal Ensemble, was an original member of the Mary Overlie Dance Co., and was a member of Channel Z, the improvisation ensemble whose members included Diane Madden, Robin Feld, Daniel Lepkoff, Nina Martin, Stephen Petronio, and Randy Warshaw. He has performed his work and taught Allan Wayne Work, the dance training system he developed, in four continents. Paul has collaborated with many wonderful performing artists for 40 years. Paul has also performed in the companies of Ping Chong, Steve Paxton, Simone Forti, David Gordon, Barbara Dilley, Ellen Fisher, Diane Torr, Wendell Beavers, and many others. So there's a lot here we could start with but I'll just start in the place that sounds like the beginning to me. In your background, as you've described to me before, there's an unexpected and circuitous route to dance. You started in other forms and had a background in the arts in your family - but can you talk about how it came to be the body and what was before that? What happened with me was I knew I loved creativity, and, anything about art I was interested in, but I didn't have a clue where to go with it... So I went to art school not knowing really anything about my own personal passions for the future. I became super interested in post-modern sculpture and performance art in my junior and senior year of college - particularly through a couple of teachers, Dennis Leon and Art Boerike. Art wrote Handmade House: A Guide to the Woodbutcher's Art. That was at California College of Art in 1971 to 1973. I was accidentally exposed to Contact Improvisation through my friend Curt Siddall, a high school friend who was in the cast of Steve Paxton's Magnesium at Oberlin College in January of 1972, which is considered the first Contact Improvisation (CI) showing. During that year when I went back to school I continued to study performance art and sculpture. Little did I know, most of the people I was studying in contemporary sculpture like Bob Rauschenberg, Bob Morris and Bruce Nauman were all performing at times with and friends of people like Steve Paxton, Simone Forti and Yvonne Rainer who I would later work with in NYC. So I was actually studying the visual arts people that post-modern dancers were most interested in - I felt a stylistic kinship, but I had no clue that these art and dance worlds knew each other. Then, I didn't know much about New York at all or the interface of post- modern dance and art. Steve and a group of people including Curt made their first trip to California in the spring of '73, Curt and his then girlfriend Nita Little were staying with me - I went to every rehearsal, I followed them to LA - that's when "Contact" it took me over, I just had to do it, I still didn't understand that it had an intellectual aspect, or that it could be a career or my future, but I do remember starting to realize that oh, Steve Paxton wasn't just some guy that was off in the Vermont woods dancing, but that he was connected with the greater world of arts and ideas. On that first Contact tour to California, he presented workshops at Mills College, he knew Bob Ashley, the musician who was teaching at Mills at that time. When we went to LA, we stayed in a big house owned by the Grinstein family with a well-known art collection. As we drove into the grounds, there was a huge Bob Morris sculpture in the front yard of cut up logs which I had just studied in school... This was an Ah Ha moment for me. I had again fallen into a part of the art world my curiosity had already led me to at school. So looking back, the jump from contemporary sculpture to Contact Improvisation was surprisingly small for me-- I was making sculptures where I would haul big pieces of 4x8 plywood and make fantasy houses, partial houses, such as meditations on attic spaces, and when I started doing Contact it was almost like I was making my sculptures, except I was working with other peoples' moving bodies. This was satisfying and very connective for me, because my personality is very social, and a lot of visual artists tend to pull themselves into their studio, get very focused on their work and that can be lonely-- not my temperament, I knew that for sure. So, it was a very logical flip into dance and performance for me, from my art studies in college. But I had no particular interest in other kinds of modern dance at the time - I was really interested in new work that was visually and philosophically groundbreaking, no matter what form. It was just chemical for me-both instinctual and intellectual.